Campbell Ministries was established in 1995 by Prophetess Amina Campbell Jackson, and she is doing some great things in the community! If you are in the Jackson, MS area, and you need a church home, stop by Charity Full Gospel Baptist Church. Located at 234 W. School St. Ridgeland, MS 39157. Sunday School 8AM, Morning Worship 9AM, Bible Study & Prayer, Wednesday 6PM. CFGBC Vision: The CFGBCF exists to love God, and to love our fellow man. In doing so, we are able to keep all other commandments. 1 Corinthians 13:13 (ESV) So now faith, hope, and love abide, these three; but the greatest of these is love. 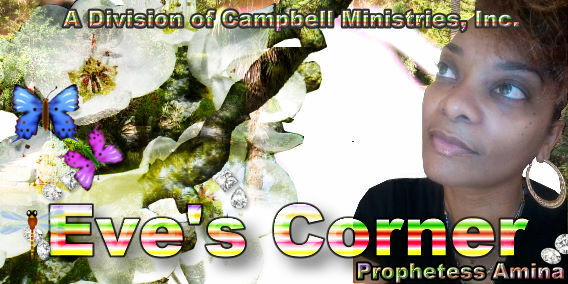 Campbell Ministries does a bi-weekly internet radio show and podcast, called Eve’s Corner. It is broadcasted on BBS radio. 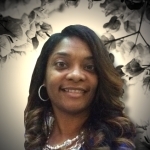 Eve’s Corner is a show of encouragement, empowerment, and enlightenment! This show is for EVERYONE! You can get show information from the website at www.campbellminstries.com or from her Facebook page, titled Campbell Ministries. Be sure to also check out the archives for previously aired shows! Campbell Ministries also founded Your Big Sisters Closet. This ministry provides prom dresses for young ladies who otherwise would not be able to attend the prom. Dresses are collected and cleaned all year long, to prepare to provide dresses for seniors of all sizes and backgrounds. So if you have gently used prom dresses or formal wear, please donate them by mailing them to P.O. Box 16214 Jackson, MS 39236. Campbell Ministries is offering products…we have holy anointing oil. For a donation of at least $12, you can obtain a 1 oz. bottle of oil that has been prayed for, and blended according to scripture (Exodus). In fact, some of you may know, anointing oil is kind of expensive, so this is a good rate…again you can get 1 for $12, 2 for $20, or 3 for $30. So buying in bulk will save you money. You can send in your request by clicking the donate button below, then leave a note with your request for oil, and how many you need. You may also send your request by regular mail to PO Box 16214 Jackson, MS, 39236. As you know, as with all other spiritual tools, the real power comes from God. Anointing oil is a symbol of your faith in God and of God's ability to cleanse and make things holy. Without faith, anointing oil will not have any positive effect. You can use oil to help strengthen and demonstrate your faith, but you cannot use it to replace faith. So I encourage you, get some oil to anoint your house, anoint yourself, anoint your children…get some extra bottles for your office, give one to your spouse, keep one in your purse or car!